In this third title in the Faithgirlz Glimmer Girls series by Natalie Grant, Miracle in Music City, the Glimmer Girls are at it again—looking for a mystery to solve. Gloria wants her daughters to learn they aren’t too young to make a difference, so she gets them involved in her annual benefit and auction. But as things often do with the trio of smart and sassy sisters, they get themselves and their nanny Miss Julia involved in a lot more than just helping mom raise money for a worthy and wonderful cause. 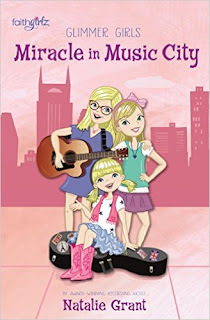 Miracle in Music City by Natalie Grant is a fantastic book for young girls! My daughter loves the Faithgirlz Glimmer Girls series by Natalie Grant and this third title sure doesn't disappoint. I think it took her about 2 days to read the entire book because she just couldn't put it down. I love that Miracle in Music City by Natalie Grant contains a trio of smart and sassy sisters because I just happen to have 3 girls who are also quite smart and a little sassy at times. I think it's one of the reasons my daughter loves this book but she also loves a little mystery so Miracle in Music City is right up her alley. Miracle in Music City by Natalie Grant is full of adventure, mystery and fun and is sure to entertain! You can find Miracle in Music City by Natalie Grant on Amazon, Barnes and Noble and other bookstores.